Ornamental Gardening and ‘Backyard Living’ are at an all time high in popularity. It seems that everyone wants to get ‘outside’ and enjoy the simpler pleasures. Nothing is better to me than sitting in my backyard by my water garden and watching the birds and butterflies at play. 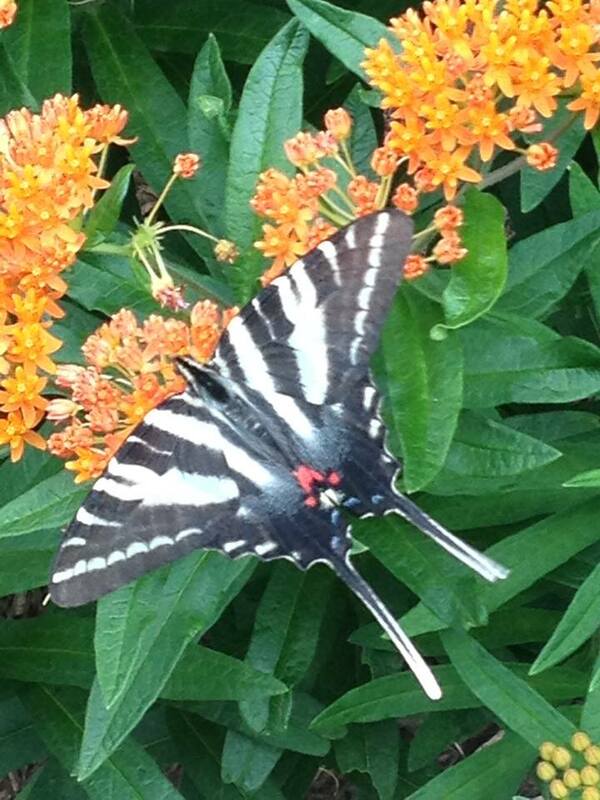 Many different types of birds visit my garden on any given day and in the summertime the butterflies abound! They eat, play, nest and bathe… and in the process my family and I get to enjoy the gifts of nature. Zebra Swallowtail nectaring on Milkweed. Like ALL living things, these beneficial creatures need certain basic things to live and prosper. This basic list is simple – food, water, shelter & places to raise young. If you provide these things, you will see your new friends moving in almost overnight. I want to walk you through a few simple things that you can do right away to increase the number of birds and butterflies in your landscape. – Plant some native Trees, Shrubs and Flowers. Using the right plants will provide places for shelter, nesting and food & will add beauty to your landscape! The great thing is, many of the plants that shelter and feed the birds and butterflies are native plants. Most of these natives are long lived, drought hardy and insect and disease resistant. – Put in a Water Feature. Water is the ‘Stuff of Life’! We must ALL have water to live. Your water feature can be as simple as a bird bath or as large as a custom Pondless Waterfall, Water Garden or Rainwater Harvesting Feature. The main thing to remember is birds like shallow water for bathing and drinking (2″ to 4″). Think about your overall Landscape Design and get some water in the mix! 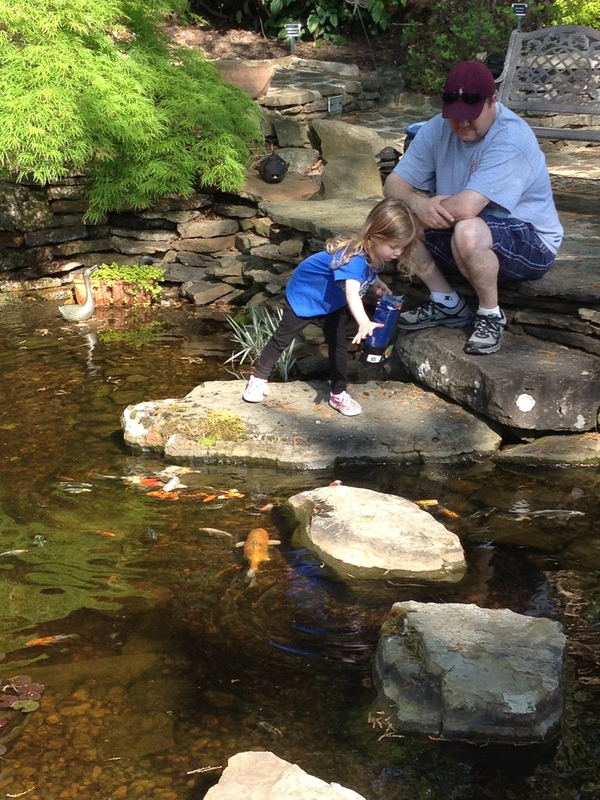 Your kids will really engage with a Water Garden. – Put up some Feeders. Putting up a few feeders will almost immediately draw in some new visitors. Platform feeder are great for black oil sunflower seeds, fruit, bread, nuts and more. Tube feeders and socks are great for Black Thistle ( A Finches Favorite). A large hopper type feeder is great for general feeding and can be filled every few days with an inexpensive song bird mix. Suet feeders are great and you can hang or mount them almost anywhere. AND don’t forget the Hummingbirds! In the Spring and Summer season I have 6 Hummingbird feeders going constantly. I have to fill them everyday ! There are even Butterfly feeders that you can put nectar and fresh fruit in to attract and feed butterflies. Spread your feeders out a bit around your outdoor living/viewing area. It will give you multiple viewing opportunities and it will give the birds a bit of room to move around. I have over a dozen feeders up at any given time and I just LOVE them! – Put up some Bird and Butterfly Houses. Some birds require housing to get their attention! Bluebirds and Martins are at the top of the list. Not only do these birds require housing, they are real particular on the placement, color and construction of these houses. – Martins like to be on a high pole ( 10′ to 20′ high ) in an open area, with no high trees within 40′ to 60′ from the their house! They like their houses painted White too! – Bluebirds like to be 4′ to 5′ above the ground with a 1 ½” hole for a door! They also like open areas within view of their perch for easy hunting and feeding. If you get it right, you will be blessed with some AWESOME birds that will eat their weight in insects and will thrill you daily with their beauty and grace. And don’t’ forget the Butterflies! A butterfly house makes for a great conversation piece and is a really unique addition to your garden. Want to help your environment and make your little critters healthier and happier? Think Organic! Pesticides and other garden chemicals are VERY harmful to Birds and Beneficial Insects! It’s not easy being green, BUT it’s not that hard either. Try to use some organic alternatives like Neem Oil, Insecticidal Soap, Dormant Oil and Non-Chemical fertilizers. You will notice a difference in the quality of your garden AND in the quality of your life! I guarantee it! Enjoying the abundance of nature is Awesome and it’s not all that difficult! In fact, if you do some of these things you will see an immediate increase in the number of birds, Butterflies and beneficial insects in your landscape. These beneficial creatures will make your flowers more beautiful, your vegetables more productive and your Life more Abundant ! Here’s to the ‘Life Abundant’ !